The quantities in this easy chicken recipe make for 4 servings. This is one of the easiest chicken recipes available. No cooking, no baking. Just a couple minutes of work and it's ready to serve. Wash the lettuce and drain it well. 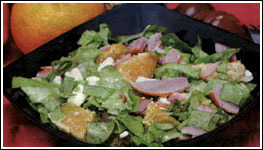 Cut it into pieces, using above picture as a guide and put it in a larger salad bowl. Peel the oranges. Cut each orange slice in 2, or if the oranges are really big, in 3 pieces. Cut the chicken pemmican slices in 4, and the cheese in small cubes. Add everything into the salad bowl. Pour the olive oil and the lemon juice over it. Add salt and pepper to taste. Mix thoroughly. This easy chicken recipe is best served immediately once ready. P.S. I hope you've enjoyed this easy chicken salad recipe as much as my family had. Below are even more tasty and easy chicken recipes for you to try. Let me know which one you liked best or share your preferred easy chicken recipe by writing me a small note.